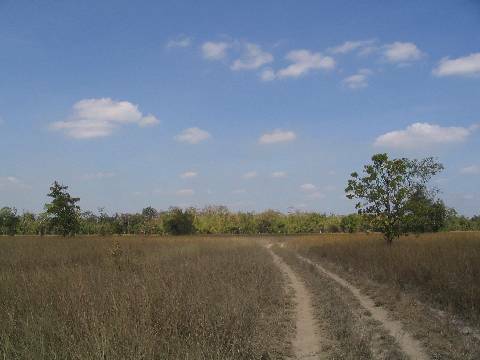 The Northeast Cambodia loop takes us from Phnom Penh to Kampong Cham, followed by Kratie, Stung Treng, Ban Lung (Ratanakiri), Sen Monorom (Mondulkiri) and Prey Veng before bringing us back to Phnom Penh. It is best to plan at least seven days for the trip. In order to ride at a reasonable pace with adequate time for sightseeing, I would suggest planning ten days for the loop. Personally, I spent nine days for the trip, with the last 2 days in Phnom Penh. The total distance I traveled was around 1500km. The roads near Phnom Penh are in good condition. 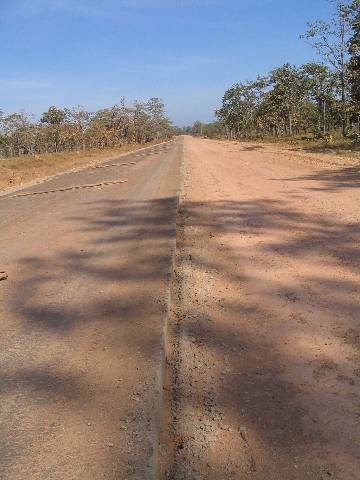 However, these tarmac roads gradually deteriorate into dirt and gravels as you traveled further away from Phnom Penh. Of course, the Death Highway between Banlung and Sen Monorom is on another level altogether. 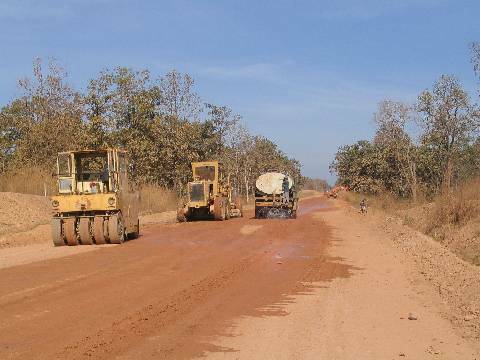 But with the road constructions that have been going on around Cambodia, things might improve in the near future. In Cambodia, it is easy to know that you have arrived at a major town or city. 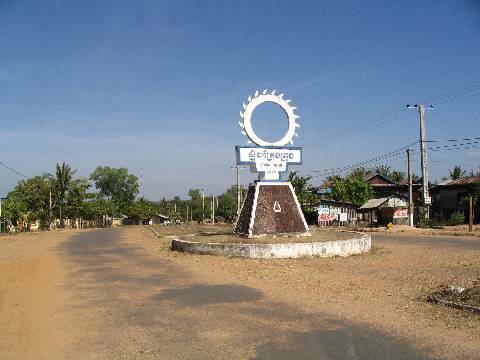 In almost all the towns and cities I have visited, there is always a monument with a roundabout. It also serves as a good point of reference for us to get our bearings. As usual, you will find helpful road signs and kilometer stones along the way. You should not have problems finding petrol in Cambodia. If you do not see petrol stations in villages, you can still find stalls by the road sides selling bottled petrol. Remember to top up your tank whenever you can, especially if you are not sure of the distance to the next village. Since I brought along my Garmin GPS receiver during this trip, I tracked my routes and took down my waypoints. If you would like a copy of the files, just post a comment and I will send the download link to your email. The size of the file is around 1.7MB. 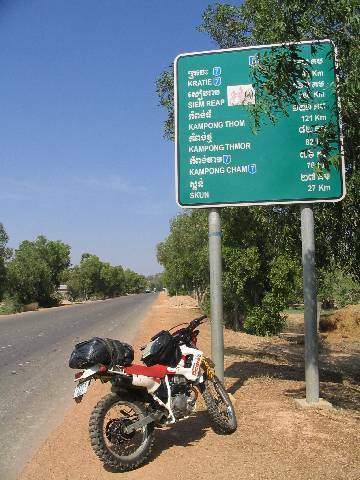 This entry was posted in Cambodia, Motorcycle Adventure Vacations and tagged Adventure travel, banlung, Cambodia, Death Highway, download, gps, Kratie, Mondulkiri, Motorcycle, Phnom Penh, Ratanakiri, roads, route, sen monorom, stung treng, tracks, waypoints by atticus. Bookmark the permalink. Planning something similar in march -april 2011, would love a look at your route. hey you. i came overland from europe to cambodia on my old bmw. i´m already in Ban Lung and will drive down to Sen Monorom soon. it would be great to have the waypoints and the track. I would estimate it to be about 4-5hrs. Hey man, nice blog posts. Mine kind of travel. Could I get the GPS placemarks for the routes in Cambodia, Laos, and Thailand from you? Are you taking any trips soon? Link to files sent to your email. I am making a trip in November. Maybe will do a bit of riding in Nepal, but unconfirmed at the moment. Impressive riding history! A small Honda wave is fine. That’s what the locals rode through the death highway when I was there. GPS link has been sent to your email. Have a great trip! looks great! planning a route myself, would really appreciate a copy of your route. have you rode anywhere else in cambodia since? I would like to get your GPS’s waypoint & route! your route sounds just like what im looking for. Thank for all the info, could you please send me your GPS way point and route? Link sent to your email. Have a great trip! 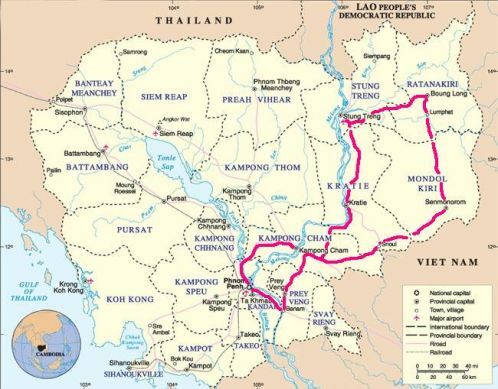 Hi, I am planning a ride to Cambodia, and would like to closely follow your route. It will be great if you can share your GPS coordinates. Thanks. could you send me the GPS route, too? Planning for PHN – Kratie – Rattanakiri (5 days). Please let me know if you have any recommendations. I guess you would be following the same route as I. Probably 1 night each at Kampong Cham, Kratie and Strung Treng. The rest of the time at Banlung. Hi, this is a great trip! We’ve been to Cambodia 2 times with organized enduro-trips and now we are planning to go there on our own. Could you kindly send me your gps route as well, it’ll help a lot. Thank you for sharing! Thank you so much :)) got it! Is it possible to send me your GPS file (1.7mb) of the death highway ? I will do it also in January 13.
ur page was very helpful for me, thanks for ur work! Could u give me a favor and drop me ur GPS route in my email address? Link sent to your email. Have a good trip! Hey – would love to have that link as well. planning to do this route in a couple weeks! Also thanks for the awesome blog – so informative. Great info. I am cycling in from le thanh in vietnam and want to ride in cambodia and laos especially along the mekong river. If you have any suggestuons on how to plan my route it woyld be great. Please send me a link to the map as well. Thanks. I would like to take the same trip. Could you please share your GPS tracking?